There were six friends who all met at university; Jen and Conor, Andrew and Lilah, and Natalie and Dan. When they were young they thought they were invincible; they could have whatever they wanted and they would make great successes of their lives. Tragically though, one hot summer day everything changed. There was a car accident that left one of them dead. Andrew had been the drivers and he would have to live with the consequences of his actions that day for the rest of his life. However, in one way or another, each and every one of the small group of friends had reason to feel guilt. Maybe it was this guilt that drove them apart because that is what happened. Many years later, Jen has her own reasons for instigating a reunion – a time to come together and try to come to terms with the past. She is selling her family’s French house where they had spent some idyllic summers; if they don’t meet up there soon, the house will be gone. However, it’s a tense time when they do all meet up especially when they get snowed in. It’s time for some home truths and honesty; but is it time for making up as well? 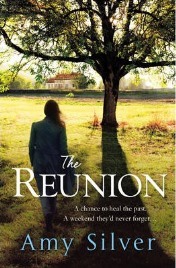 I really enjoyed The Reunion although it was not quite what I was expecting based on the other two books I have read by Amy Silver. I say this i n a good way though as I felt that The Reunion had more depth than her other lighter books. I particularly found myself warming to the different characters and I felt that it was easy to sympathise with all of them in different ways. The story is excellent and told in a clever way that enables the reader to piece together all the events that had occurred in the years that the story spanned. Some of it is told in the present. There are also flashbacks to the past and the events building up to that fateful day. All the chapters are interspersed by various emails and letters exchanged between different characters. I really liked this aspect of the story telling. The Reunion is an immensely readable book. It is also a testament to the power of friendship and a lovely insightful look at how relationships work. At its heart is also a very poignant story that certainly had me in tears at times. I definitely recommend this wonderful book. No Comments on "The Reunion"